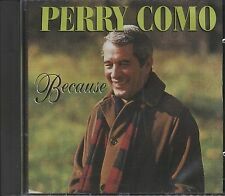 Up for Grabs, Perry Como Wanted 2 CD – Like New/Mint. Bushel and a Peck - With Betty Hutton, A. CD Like New. Hello Young Lovers. You're Just in Love - With the Fontane Sisters. No Other Love. Two Loves Have I. 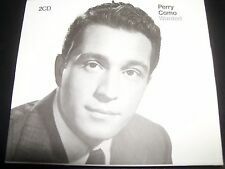 Includes:1 Perry Como With Ted Weems And His Orchestra I Wonder Who's Kissing Her Now. 2 Perry Como With Ted Weems And His Orchestra Deep In The Heart Of Texas. From ~ Perry Como. Condition of Front Insert ~ Very Good Or Better. This is a 2000, 3 CD Set. Condition of All 3 CD's ~ Very Good Or Better. When I Fall in Love. Round and Round. Are The Actual Picture of the Item For Sale. Hier folgende 2 CD / Here following 2 CD Pop englischsprachig. Title: A Lover's Alphabet Artist: Perry Como Genre: Easy Listening|Vocal - Male Format: CD / Album Type: CD No. of Discs: 1 disc(s) Studio / Label: Sounds of Yesteryear UK Release Date: 14 Apr 2017. From a collection of very well cared for Cd's. 100 % Satisfaction Guarantee. Shipped In Rigid Cardboard CD Mailer We Offer Shipping Discounts On Multi-Orders. Here's a great Music Plus Oz Gift Idea! 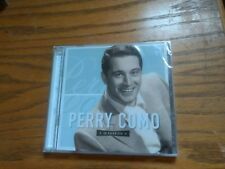 Enchanted Evening With Perry Como Original Recordings CD Like new in original case! This album may contain some case scratches and is also open. Exclusive storefront inventory, album may not have sleeve present. See pictures for details! Shipped with USPS Media Mail. THERE ARE 49 OF HIS GREAT CLASSIC HITS ON THIS 2 CD SET FROM THE 50'S AND THE 60'S AND THE DATE OF THESE CD'S ARE 1993. THE CONDITION OF THE CD'S ARE VERY GOOD, THE JEWEL CASE'S ARE GOOD, AND THE INSERTS ARE GOOD. Title: Best Of 2Cd. Artist: "Como, Perry". Format: CD. Missing Information?. Condition: New. Title: Greatest Hits 1943-1953 Artist: Perry Como Genre: Easy Listening|Vocal - Male Duration: 149 mins Format: CD / Album Type: CD No. of Discs: 2 disc(s) Studio / Label: Fabulous UK Release Date: 15 Sep 2008. 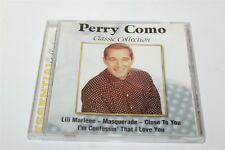 Title: Perry Como Genre: General|tbc Format: CD / Album Type: CD No. Title: The Best of Perry Como Artist: Perry Como Genre: Easy Listening|Vocal - Male Duration: 58.50 mins Format: CD / Album Type: CD No. Case & Booklet Are In Good Condition. Disc Is In Good Condition. They were quick & accommodating. My order was exactly as advertised & it arrived quickly. - Fallon Savoie. Everything Else. Cassette Tapes. In the 1950s, eleven of Perry Como's records sold in excess of one million copies each. We concentrate on his recordings from the 40s through to 1960 when the hits just kept on coming. UPC: 805520091954. Zudem war er der erste Sänger, dem es gelang, 10 Singlehits je über 1 Million mal zu verkaufen. Diese CD sollte in keiner Perry Como Sammlung fehlen. But statistics fade into insignificance when you consider Como's vast musical legacy. Artist: Como Perry. Title: The Essential Early Recordings. Format: CD. Missing Information?. Slightly rare 3 CD set in thick case. In very good condition, but no printed booklet. And be sure to add us to your. favorites list. THIS CD HAS 65 GREAT CLASSIC HITS FROM ARTISTS SUCH AS BING CROSBY, DEAN MARTIN, PERRY NAT KING COLE FROM THE 50'S THROUGH THE 60'S AND THE DATE ON THE CD IS 2005. THE CONDITION OF THE CD'S ARE VERY GOOD, THE JEWEL CASE'S ARE GOOD AND THE INSERTS ARE VERY GOOD. 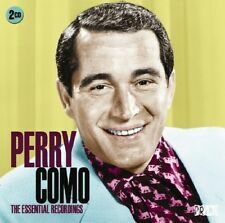 Perry Como - The Best Of Perry Como. • CD jewel case includes outer cardboard slipcase (O-card). • Still in original factory shrink wrap. Browse My 5,000 CDs/Records/Tapes ». "Quick, professional service". PERRY COMO - I DREAM OF YOU. ArtistPERRY COMO. Our specialized fields are in rare Japan. hard to find records and new Japan cds. 3~5 MINI LP CD. if your item had any problems such. We must work hard to solve. the problem and make it right. Time Music Presents Perry Como - BRAND NEW SEALED. Condition is Brand New. Shipped with USPS Media Mail. BONAPARTE'S RETREAT ~ KAY STARR. BOOGIE WOOGIE BUGLE BOY ~ THE ANDREWS SISTERS. PRISONER OF LOVE ~ PERRY COMO. THE CONDITION OF THE CD IS VERY GOOD, THE JEWEL CASE IS GOOD AND THE INSERTS ARE GOOD. 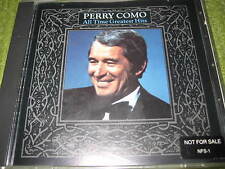 Title: The Essential Early Recordings Artist: Perry Como Genre: Easy Listening|Vocal - Male Format: CD / Album Type: CD No. of Discs: 2 disc(s) Studio / Label: Primo UK Release Date: 24 Jun 2016. YOU BELONG TO MY HEART - BING CROSBY AND XAVIER CUGAT. IF I LOVED YOU - PERRY COMO. DIG YOU LATER (A HUBBA-HUBBA-HUBBA) - PERRY COMO. CD IS IN GREAT SHAPE. SONGS ARE;. LAURA - WOODY HERMAN. CALDONIA - LOUIS JORDAN. Used but CD, Case and Inner Insert/Sleeve in VERY GOOD CONDITION! CD has very minor scratches that do not effect playback! Inner sleeve has a fold marking on left side.very minor as well. This is an original RCA /BMG Records Label CD Release.it is NOT a CD-R/RW. Dear Mom - Sammy Kaye 2:58. Lili Marlene - Perry Como 2:56. Don't Sit Under The Apple Tree - Glenn Miller 3:10. When The Lights Go On Again (All Over The World) - Vaughn Monroe 2:58. Gee, But It Is Great To Be In The Army - G.I. Chorus 2:47. MR. C on a way cool compilation. 2-3 Hot Diggity (Dog Ziggity Boom) 2:23. 1-5 The Shadow Of Your Smile 3:46. 2-4 It's Impossible 3:12. 1-12 When I Fall In Love 2:58. 3-5 Catch A Falling Star 2:26. 3-6 Ko Ko Mo 2:42. 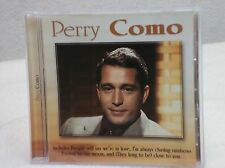 Perry Como BEST OF 50 Track Essential Collection PAPA LOVES MAMBO Like New 2 CD!